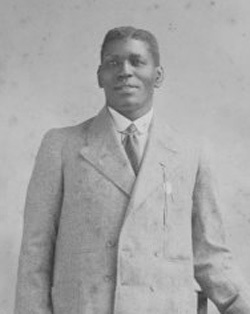 Peter Felix was born on the 17th July 1866 on the West Indian Island of St.Croix, the same birthplace as the immortal Peter Jackson, who he claimed to be his first cousin (Jackson was actually in Felix’s corner for some of his fights). Felix was tall for his time, standing at 6’ 3” tall, and weighing in around 180 pounds. He was said to be a flashy dresser, extravagant and a bit of an extrovert, quite the opposite of the quiet, gentlemanly Jackson. He started his pugilistic career in Australia in 1894, with a 12th round knock out win over Dan Keeley in Melbourne. The year of 1895, proved to be one of the most fruitful of his career, with three very impressive points victories over the wild man Joe Goddard, and a points victory over the superbly skilled but light punching Mick Dooley. 1896 saw him defeat Starlight Rollins, beat Mick Dooley in two out of three fights, and beat Dan Keeley for the Victorian Heavyweight title with a 5th round knock out win. The next two years saw him draw with Mick Dooley, Tut Ryan and Bill Doherty. It must also be noted that during the depression years of the 1890’s that Peter Felix also fought in unofficial bouts in travelling boxing troupe’s, which toured the agricultural shows of Australia, putting on their fights in tents. Next up, he scored a draw with an old and sick Peter Jackson over 25 rounds in Melbourne, then he captured the coveted Australian Heavyweight title with a 7th round knock out win over Bill Doherty in Kalgoorlie. Racist attitudes had raised their ugly heads prior to this bout, when Doherty had beaten Dooley to win the Australian crown. Dooley has been quoted as saying “You’re too good for me Bill, but I would sooner lose to you than Felix. Keep” - his voice broke and died to almost a whisper – “Keep the championship white”. Doherty failed to do this. Felix defended his title successfully with a 20 round draw with Doherty, but then lost it to the ubiquitous Doherty via a 20 round points loss. Felix never won the Australian title again, though he challenged for it three times, once against Doherty for a points loss in 1902, and twice against world title challenger Bill Lang for two knock out losses in 1907 and 1908 (Felix was 41 years old when he faced Lang). In Felix’s next notable bouts he beat the giant woodchopper Bill Heckenberg with a 2nd round knock out, drew with Arthur Cripps and beat the Maori, George Renaulf on points. Age was starting to catch up with the old warhorse, though he was still fighting in main events. The years of 1904 and 1905 saw him lose inside the distance against world title challengers “Boshter” Bill Squires (3 times) and “Gunner” James Moir. In 1907, Felix challenged the legendary Jack Johnson for World Coloured Heavyweight Championship. Felix was knocked out in 1 round. Felix kept fighting until 1915 (aged 48 years old), though his last real “big time” fight was in 1908 in the very first main event ever held at the Sydney Stadium, in Rushcutters Bay (the stadium where Jack Johnson beat Tommy Burns). In this fight he lost on points over 20 rounds to Sid Russell. Peter Felix retired to Sydney where he passed away on the 10th November 1926 of a heart attack aged sixty. He fought a large number of world class fighters, and held his own against most of them. He was perhaps a bit unfortunate that his career started at the advanced age of 28 years old. Some sources report "D 15"
Some sources report "D 20" in "Kalgoorlie, WA, Aus"
Some sources report "L 20" in "Ultimo, NSW, Aus"
-Some sources report "WF 16"